Glenn Donald Pugmire, 90, passed away peacefully on 2 April 2014 in Gilbert, AZ. 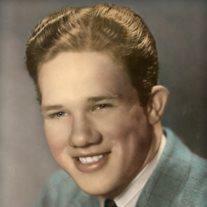 Glenn was born on 19 August 1923 as the son of Justin and Clara Pugmire in Midvale, UT. Glenn grew up in typical Depression era circumstances with little material wealth. Family, faith and industry, however, more than compensated for financial challenges. Glenn grew up with seven siblings, Gerald, DeVearl, Farrell, LaVon, Theora, Glenn and June. Glenn met June Leitzell at Jordan High School and married her before leaving for WWII military service in the Air Corps. When he returned from Pacific theater service, Glenn and June raised six children, Donald Glenn (Jolene), Robyn June Stone (Ron), Mark Dee (Laurel), Brent Justin (Terri), Julee Ann Brady (Pat), and Marcee Jo Alston (Steve). Glenn’s love for construction and building not only provided for his family as a construction engineer for Amoco Oil but building was also his happiest hobby. During Glenn’s and June’s life together, Glenn and June were unusually happy and devoted. Their most enduring legacy is their exceptionally strong romance. Glenn was also devoted to The Church of Jesus Christ of Latter-day Saints. He served in many church callings, including bishop in Portland, OR and Overland Park, KS, an ordained patriarch, a temple ordinance worker, and a full time mission in Bermuda. Glenn cared for June until her death on 25 April 2011. He later married June’s best friend, Martha Barton and loved his time with her. Glenn is grandfather to 33 grandchildren and great grandfather to 97 great grandchildren. Funeral services will be Monday, 7 April 2014 at the Queen Creek North Stake Center, 22035 East Ocotillo Road, Queen Creek, AZ at 10 AM. The family will greet visitors at a viewing that begins at 9 AM. Arrangements by Bunker’s Garden Chapel.